2016 has brought renewed attention to O.J. Simpson's high-profile trial and acquittal for the murders of his ex-wife Nicole Brown Simpson and Ron Goldman. Ryan Murphy's miniseries The People v. O.J Simpson: American Crime Story shed light on what happened behind the scenes during the trial of the century — but, interestingly enough, Simpson himself wasn't the main focus of the show. ESPN's docuseries O.J. : Made In America takes a different approach and focuses on the rise and fall of the once-revered football star. Of course, the murder trial was a defining event of Simpson's life and it will receive plenty of attention. 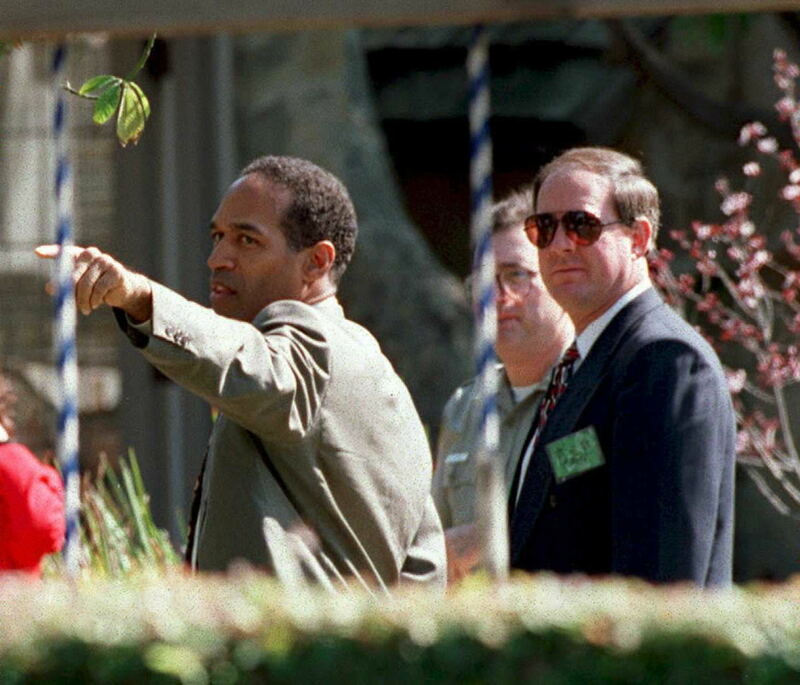 Hotly-contested blood and DNA evidence was presented at trial, much of which came from Brown Simpson's condo, but O.J. Simpson's Rockingham estate was also a key location that was searched by investigators. For those who are unfamiliar with Los Angeles, Rockingham isn't an area we've heard about outside of the Simpson case. In fact, it's not even its own neighborhood — rather, Rockingham is an avenue located in the swanky neighborhood of Brentwood. According to The Chicago Tribune, Simpson resided at 360 N. Rockingham Ave. at the time of the murders — two miles away from Brown Simpson's condo. According to a geographical "cheat sheet" put together by E! for American Crime Story viewers, the residences of Brown Simpson and her ex-husband were on "opposite sides of the real estate tracks" despite the fact that Brentwood is an extremely affluent community. In short, his home was "above Sunset," while her's was "below Sunset." Although Brown Simpson's residence on Bundy Drive was the crime scene, Rockingham became a key part of the investigation. As reported by The Associated Press, blood on a pair of socks found in Simpson's home contained the genetic markers of both he and Brown Simpson. Furthermore, the infamous white Bronco chase came to an end when Simpson surrendered to police at his Rockingham home as millions of people watched the events unfold on TV. The Chicago Tribune also reported that Simpson purchased the estate for $650,000 in 1977, when he was at the height of his professional football career. The 6,200-square-foot mansion featured everything from a waterfall to a tennis court to swimming pools, but Simpson was evicted in 1997 after defaulting on the home's mortgage. An investment banker bought the estate for nearly $4 million dollars, but opted to demolish the home and rebuild it. According to CNN, residents of Rockingham Avenue were relieved when the mansion was destroyed — tourists had reportedly flocked there due to an ongoing fascination with the case and all its main players. The outlet quoted a Brentwood resident as saying: "This is what it takes to slow down the insane circus that Brentwood has been for the last 4 1/2 years. To the new owner, I say good luck." But, 360 N. Rockingham Ave. hasn't escaped its association with Simpson. Earlier this year, reports emerged that a knife found on Simpson's former property was being tested for evidence. Although it was concluded that the knife was not related the murders of Brown Simpson and Goldman, it renewed interest in the Rockingham property. Although the address remains famous, the new owner made sure to demolish the entire structure — so the mansion at 360 N. Rockingham Ave. today doesn't resemble the one that was inhabited by Simpson. In fact, E! reports that even mementos from the original home were destroyed because the new owner wanted a "blank slate." The Rockingham estate will always be famous, but its new owner and residents of the avenue are doing their best to put the Simpson case in the past.